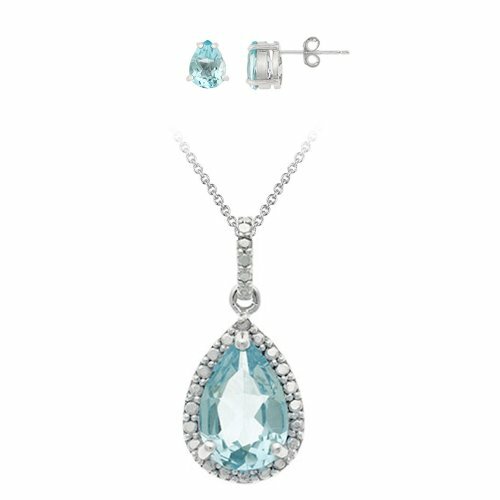 Add some serious bling to your collection with the Sterling Silver Genuine Diamond and Blue Topaz Pendant and Earring Set. A 925 sterling silver rolo link chain with a spring-ring clasp holds a beautiful sparkling pear-shaped aqua-blue topaz at a 1-inch drop. Glimmering diamonds surround the stone, as well as being embedded on the silver clasp that holds it dangling to the chain. The same silver setting surrounds each earring, with a secure la-pousette post and clutch. Each blue topaz is faceted to reflect the light for maximum brilliance. Length of necklace: 18", Length of earring: .3", Width of pendant: .4", Width of earring: .2"
The necklace and earrings are pretty, therefore worthy of 2 stars. There are absolutely no diamonds, however. I honestly did not have high expectations considering the price I paid, but thought there would at least be very low grade diamond chips as the description indicates. Instead, the "silver", if that's what it is,is merely molded into the shape of diamond chips to create the look of them. As this is a gift for a young child, who will enjoy it anyway, I will keep this item, but I certainly will not order jewelry here again. I bought the set unsure as to what I would receive for the price. The color of the stones were nice and although you could barely see the "diamonds" it was an okay buy for the price. I love it. It is a beautiful set. I was satisfied. I got this as a gift for a co-worker. The stones were a great size, large, but not too huge. She loved it!